I have always loved stir-fried rice, but as I’ve gotten older, I am less and less satisfied with the greasy stuff at the Chinese takeaway. And as I’ve gotten older, I cook more meals and therefore have more bits and bobs laying around getting ugly in the fridge. You know, half an onion here, a bit of cold rice there, some veggie bits that aren’t quite enough for one serving on their own, but make a pretty good pile if thrown together. And I always have eggs. Just pour the lightly beaten egg in and leave it cook on medium. Stir-fry, therefore, is perfect. It uses everything up (virtue), fulfills my veggie quota (more virtue), and gives us a vacation from my usual seasonings to go more Asian (variety). And now that I know the easy secret of how to get the egg bits looking and tasting great, well I think I am positively gourmet. It’s already vegetarian; vegans can skip the eggs and pan-sear super-firm tofu instead. 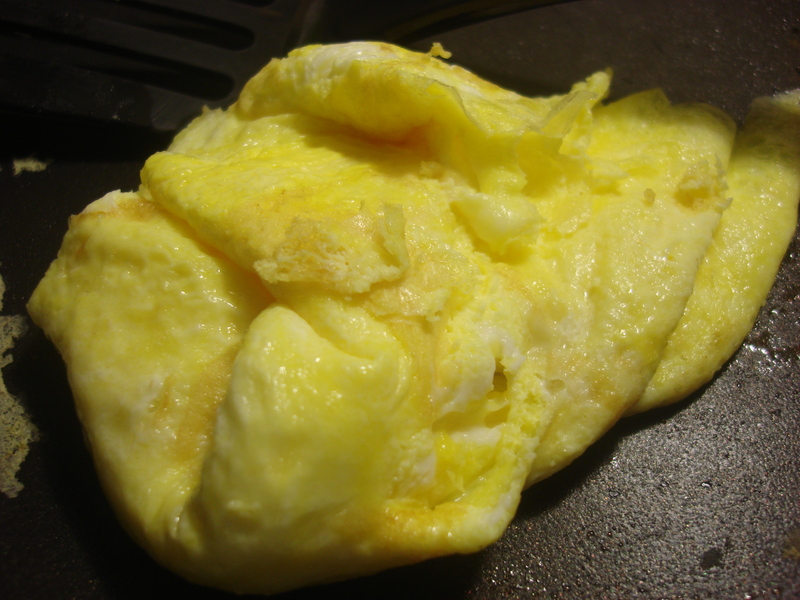 You might end up folding up the egg “pancake”. Doesn’t matter! The following recipe is the long version, as the stir-fry sauce is homemade. But you can easily sub in a few tablespoons of whatever salty Asian sauce you have around; I often use one from Sang Lee Farms in Long Island’s North Fork, or my quickie reconstructed version. Just try to use low-sodium soy sauce so you can control the salt. Whisk broth, wine, soy sauce, olive/sesame oil, cornstarch and chili sauce in a small bowl. Set aside. Heat a 12-inch skillet to medium, with just enough oil to coat. 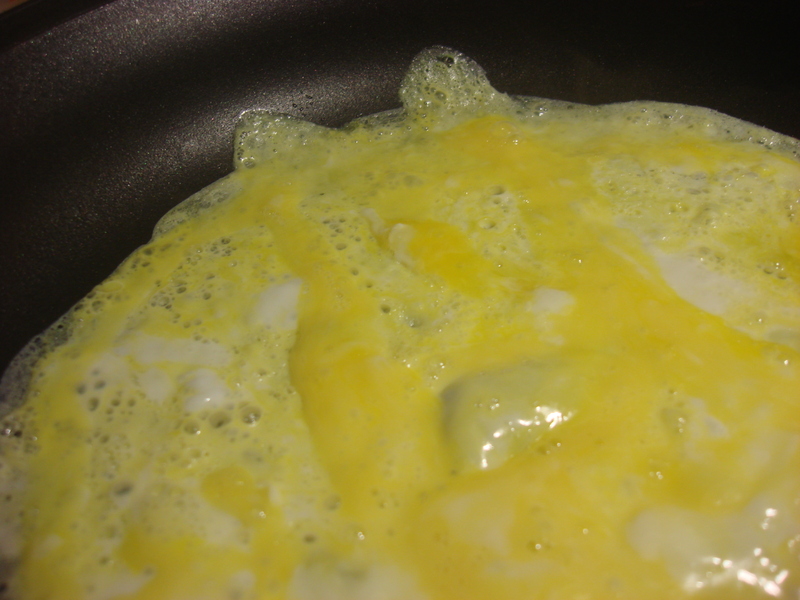 Add a pinch of salt to the beaten eggs and pour into the skillet. Allow to cook through slowly, without turning, to make a flat pancake. Before it starts to brown, flip the egg (it’s fine if it breaks in half or even if you end up folding it over) to heat through on the other side. Then remove from heat and allow to cool. Then, heat 1-2 Tbs vegetable oil in the skillet (no need to clean it), until just rippling and just beginning to smoke. Add the onions, garlic and vegetables and sprinkle the sugar over, coat with the oil and cook, stirring frequently, for about eight minutes, looking for caramelization on the vegetables. Lower the temperature to medium if you get a lot of sticking. In the meantime, slice the cooked egg into strips. In the skillet, push the vegetables to the side and add the sauce. Stir for a bit less than a minute, or until warmed and the sauce gets a bit thicker. Add the rice, mix to heat and combine. Then add the egg, stir to mix and serve. Hi Natalia: Will enjoy following you from over here at SavvySingle Suppers where my WASP roots show too much! I think I will enjoy spicing-up my cuisine & recipe box. Yum! Thanks for the visit…I will be catching up with your blog this evening I hope! You can surprise her next time….Thanks for the visit! 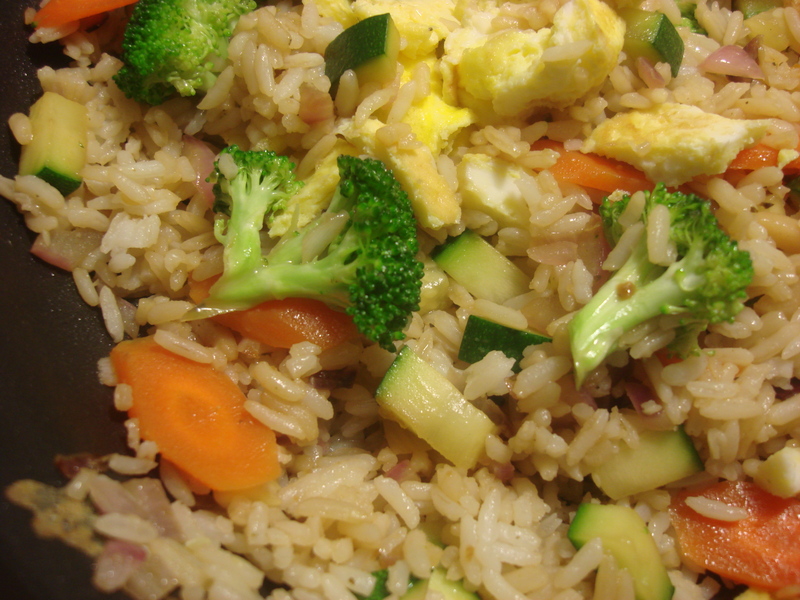 Homemade fried rice is definitely better and yours sounds great. I like that you added a little chili sauce to it. Thanks Karen; it’s a quick little recipe that does the job! Looks fantastic! I agree – I had the epiphany a couple of years back that the home made stir fry is best! thanks, TW! Great to see you again…check your messages for a private email! This looks like a dish that all three of my kids would enjoy. Thanks for the recipe. I really look forward to trying it!! I’m always looking for more recipes like this! YUM, looks and sounds great!! So good to hear! Thanks for stopping by and let me know how it goes….